Discovery & Insights: Broadcast / Cable Re-Transmission Agreements: Why Should We Care? Broadcast / Cable Re-Transmission Agreements: Why Should We Care? On the surface, there is little that appears as boring as the recent announcement that Time Warner Cable and Sinclair Broadcast Group have reached a cable re-transmission agreement. The net result of this news: nothing changes for viewers. Broadcast television stations create local content and can have exclusive local licenses to network and syndicated content. This means that WFAA-TV, Dallas ABC, produces local news at 6pm and 10pm, they carry ABC network programming exclusively in Dallas, and they have Oprah, for instance, through exclusive syndication. Local television stations, therefore, own or have an exclusive local license to everything that they broadcast. From their towers, broadcast stations typically send out their content over an analog and a digital signal. As a viewer, you can pick this up through an antenna for free. Sometimes. Some rural viewers do not get a quality over-the-air signal, for instance. 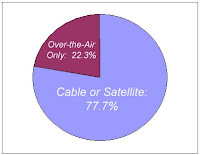 In the Dallas area as an example, 77.7% of the homes have either cable or satellite. So, 22.3% (529,890 households) are using this over-the-air signal while 77.7% (1,848,770 households) are tuning into the local channels through a cable or satellite system that is re-transmitting these local stations on their system. In a small number of cases, people get up and flip the A-B switch on their cable box to view via antenna, but most of the time, people use the online guide to switch to ABC. Cable systems must get permission to re-transmit local broadcast station content. For cable systems and local broadcast stations, this negotiation is critical. Most cable system subscribers expect to be able to get their local channels through their set-top box with no additional effort on their part. For local broadcast stations, there is a definite benefit as well. Broadcast stations have a coverage area that is strictly defined by the amount of power they put through their tower, the height of their tower, and the geography of the region. Cable re-transmission allows local stations to reach much farther away from their tower, increase their viewing area, and to reach new viewers with no additional cost. They do not have to build additional towers or increase the power of their signals. Larger coverage areas and larger potential audiences lead to higher viewership, higher Nielsen ratings, and more advertising revenue. And, at least in the beginning, local cable systems were not a serious competitor for local television advertising dollars. Value of True Local Content - The FCC recognized the value of local content and the role local broadcast stations have in their communities by providing local content like weather, news, emergency warnings, and local sports. Therefore, cable and satellite systems can not bring in out-of-market stations and call them ‘local’ to specific markets. For example, KNBC-TV (Los Angeles NBC) could not be brought into Odessa Texas by the local cable system and called the ‘local’ affiliate for Odessa. Must-Carry Provisions – This means that any broadcast station in a market has the right to be carried on all cable and satellite systems in their market as the ‘local’ affiliate. For example, WFAA-TV (Dallas ABC) can assert must-carry and Time Warner is obligated to put the station on their cable systems in Dallas. Must-carry involves no financial obligations from either party. Re-Transmission – This means that a broadcast station, as the content owner in a local market, is not obligated to make their content available to cable systems for free. They are able to withhold their content and negotiate terms for re-transmission. A local broadcast station could either assert their must-carry rights OR negotiate a re-transmission agreement that might include some sort of compensation or other provisions. In the past, local stations exercised their must-carry rights to force cable systems to carry their content, but provided their content for free. However, in recent years, local stations have begun to reconsider this practice. Considering the benefits to local broadcast stations, why does providing content to cable systems pose a problem for local television stations? While not historically a threat, local cable systems are now one of the biggest competitors of local television stations when it comes to local commercial advertising sales. In addition, local cable systems now routinely charge their subscribers an additional $4.00 - $10.00 per month to access the local broadcast channels. They are charging customers for content that they are getting from local broadcast stations for free. Local Broadcast stations know how important and profitable it is to cable systems to provide access to the local broadcast station content to their subscribers. Would subscribers pay for cable that did not include local channels? If Satellite reaches an agreement with local stations, would cable subscribers convert to satellite rather than cable? And, perhaps the biggest question, if cable systems pay one station in one market for local content, does this mean that every station in every market is going to want to be paid? Back to WFAA-TV, what if they withheld their content from cable only to find that viewers started going to ABC.com to watch Lost and Desperate Housewives each week or watched them through sling-casting from another ABC station in another market? Nobody has an idea what the full consequences would be. And, nobody wants to be the one left holding the bag. For local broadcast systems, there has been a lack of solidarity on this issue. They have been competitors first and broadcasters second. I think this is changing due in large part to broadcasters like Perry Sook (photograph), Nexstar Broadcasting, that challenged the way it had always been done and led the charge even when he had to do it alone. Pulling his stations off the cable systems in several markets when his request for compensation was denied, he jump-started the conversation of how to correctly value and compensate local stations for local content. Under Sook's direction, Nexstar Broadcasting was the first broadcast group to reach a re-transmission agreement that included some form of compensation. Now, Sinclair Broadcasting has reached an agreement, also undisclosed, that includes compensation. The battle over re-transmission is an important one for local broadcasters and content creators especially as we enter a new technical age where content can be consumed in so many new and fast-changing ways. With the introduction of video streaming, pod casting, video phones, sling-casting, and other new technologies, the battle over re-transmission will set an important precedent on the relationship between local content producers and those that amalgamate local content regardless of the technological form the distribution might take in the years to come.